It’s as simple as that. The month of May is National Bike Month and to celebrate that, we’re rewarding bicyclists with prizes. Here’s how it works. 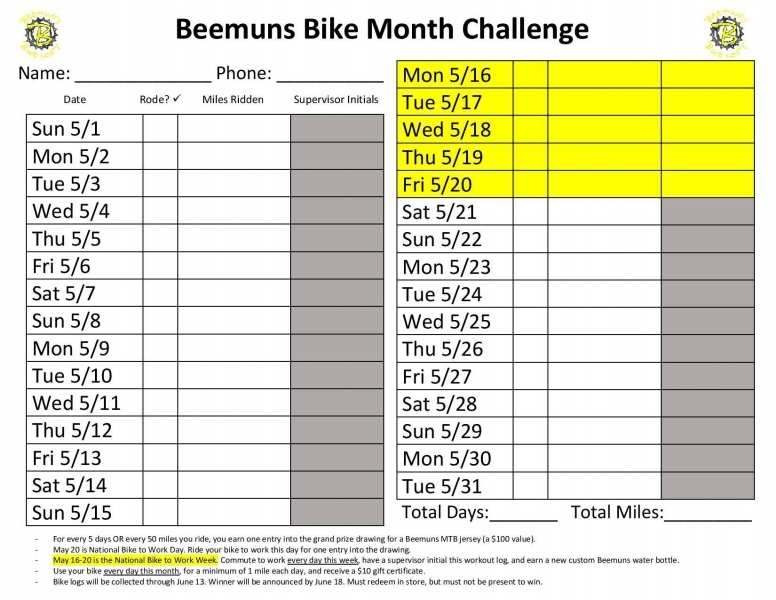 Ride your bike everyday and log it on our handy form, and you’ll receive a $10 gift certificate to Beemuns and an official Bike Loft water bottle. For every five days or 50 miles you log, you’ll get one entry in our grand prize drawing for a Beemuns MTB jersey. Commute to work Monday the 16th – Friday the 20th, National Bike to Work Week, and receive the Bike Loft water bottle. Ride your bike to work on May 20th, National Bike to Work Day, and receive one entry into our grand prize drawing. Be sure to fill out your form and turn them in by June 13th to be eligible for your prizes. Not sure if your bike is ready to handle the rigors of commuting? Meet with our experienced mechanics. They can diagnose and repair your ride and get you back on the road. Not sure if you’re equipped for the task? We can recommend the gear you need to make this cycling season your most successful yet. If riding the roads just isn’t your thing, or you can’t or don’t need to ride to work, check out these local trails. All types of riding count for the challenge and we have lots of great local options. Ride the bike path or hit the trails at Tsalteshi. Looking for a bigger adventure? Later in May the trails in Cooper Landing should firm up and be great riding. Check out our maps and plan your next ride today.